Building a dynasty of nobles, how much drier can the concept of a game possibly sound. Have children, marry them to other families, repeat until rich and and famous. I was happy to find out that this prejudice was dead wrong. 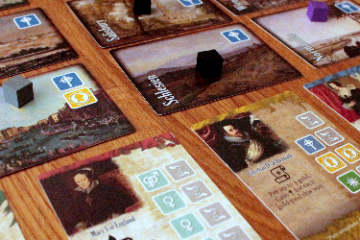 Despite its theme, Among Nobles is anything but dry, it has a great balance of simple rules, strategic decision and player interaction. Greenland is a pretty hostile environment for human beings, and survival is at stake there every day. Not so much nowadays, but people have been living there since long before packaged food and electric heating. The game Greenland gives you some idea just how dangerous the place is: careful planning and good tactics will go a long way, but a bit of bad luck can still wipe out your people. Metropolys – easily recognised as one of Ystari’s games by the trademark Y – is an auction game with not too complex rules but some interesting scoring trade-offs. It also features a very unique and appealing artistic style. The Maya people had a very sophisticated calendar system, consisting of multiple counts with different lengths. One of these counts is the 260-day tzolk’in. It’s also the driving force in the game, everything is moved by the turning of the tzolk’in gear, and timing your actions to make the best use of that is essential. Games let you play different roles and do things that you wouldn’t do in real life. At least I assume most people playing necromancers in a fantasy RPG, for instance, don’t mess around with the dead in real life. I’ll also assume that most people playing Christope Boelinger’s Illegal don’t really deal with drugs or weapons. That’s the role you take in this adults only party game: that of a distasteful criminal trading his illegal goods for other goods. The Roman Empire has always been a popular setting for games, so Concordia is not innovative in that respect. But it is a game by Mac Gerdts, so you know it will not be a run-of-the-mill, nothing-new-to-see-here game. Gerdts’s games are special. But even by the high standards he set with Antike, among others, he has outdone himself with Concordia. The city of Carrara has been famous for its marble since Roman times. It’s been used, by people who can afford it, all over the empire. In The Palaces of Carrara, you don’t take it quite so far, the furthest your marble travels is about 100km down the coast. But you wouldn’t want it to go further, anyway, because that short distance already gives you enough to consider if you want to win in this game, because for a game of only about 60 minutes, it sure keeps you busy. Once again, the world is in dire need of saving. But this time it is not dragons, space aliens or even the other players around the table that it needs saving from. It’s diseases – plural.